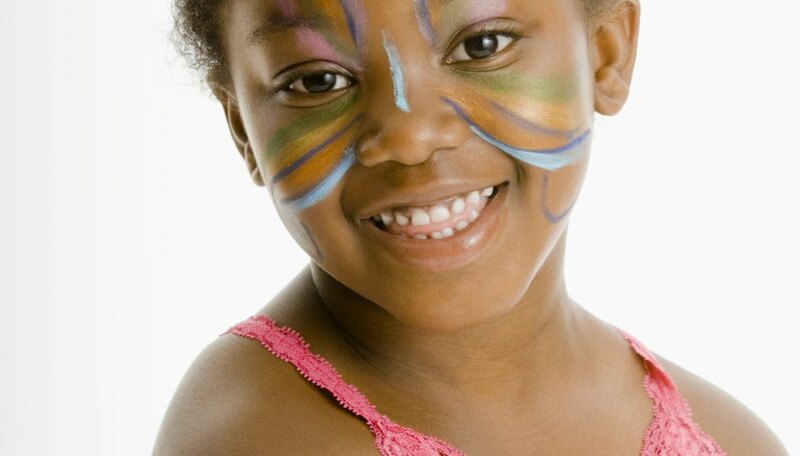 Face painting is a wonderful way to put your talents and time to good use. Startup costs for this small business are minimal, and the possibilities are endless. By following a few simple tips, you'll be making extra money on the weekends in no time. Purchase thin-tipped paint brushes, a hypoallergenic face painting kit and cosmetic wedges. Gather a cup, gallon of water, folding table and two chairs. Investigate the permit requirements for your city. You will likely earn what your business license costs your very first Saturday. Learn a few designs and practice. You don't have to be artistically inclined. Check out a few designs for boys and girls on the Internet and test them out on your kids. Load up the car and look for a park that has several jumpers set up. While it is true that you were not invited to these parties, they occur at public parks. You will be no more annoying to parents than the ice cream man. Pick the park that has the most people, the most jumpers and the nicest vehicles. Also, go no earlier than 2 p.m. so that partygoers have already eaten their cake. Set up camp and paint the faces of your own children. Then send them out to play. Soon, kids will come in droves. It's important that you don't charge, per se. Say you are doing it for donations. Parents will pay. Try to stay until the sun starts to go down. This can be difficult, because you will have a line of kids to contend with. Offer a limited number of designs so children can choose quickly. Also, tell insistent mothers that you won't paint an infant who resists. Because it takes less time to paint a full face than a small cheek design (odd but true), encourage the full face. You'll be able to paint a full face in less than three minutes and a cheek design in about five. If you find you are good at this, make some business cards. You might be able to book parties for as much as $150 an hour. Do not use cheap paints. The last thing you want is to injure or stain a child.